As you know, I am a mother to an 8 month old little girl, who is VERY active and requires a lot of attention. I do not have time to read books other than Go Dog, Go! or The Very Hungry Caterpillar very often, though sitting down with a good book is one of my favorite things in the whole world. When Isabel was born, I spent a lot of time reading parenting books when she was awake at 2 in the morning looking for a mama snack. I honestly hope I never see another parenting book! I love new ideas and new perspectives, but I have found that using my instincts and doing it our way is almost always better than trying to stress myself out by letting my baby cry in her crib or trying to follow a strict routine. So, in the past few months I have been trying to find new books that peak my interest. I have successfully found two, well more than two, but two that I am wholeheartedly gung-ho about recommending to you. 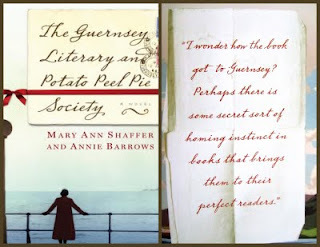 The first is The Guernsey Literary and Potato Peel Pie Society by Mary Ann Shaffer. 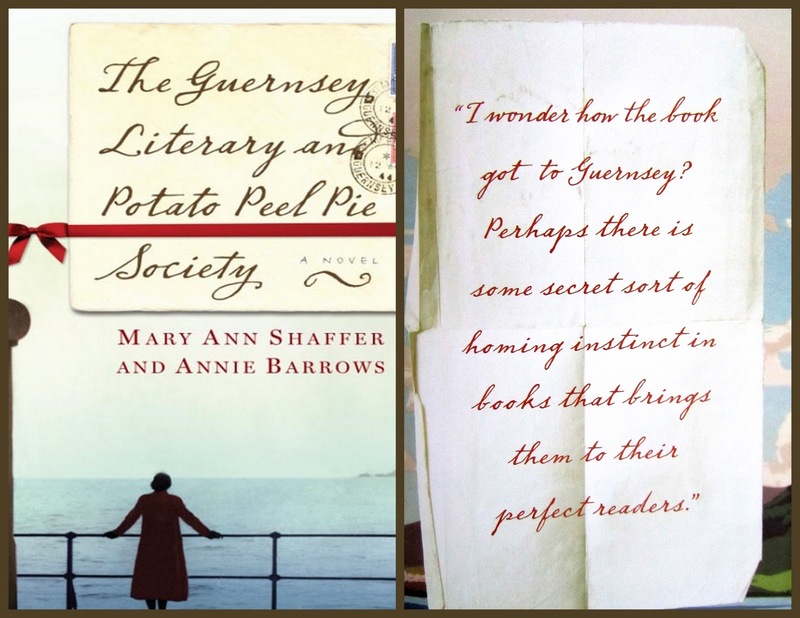 Set in the months after World War II on Guernsey Island, this book is written as a series of letters back and forth from an author to a man who bought one of her books - not a book she had written, but one he bought second hand with her information in the cover. This is one of those books where you become quickly and thoroughly involved with the characters and wish so badly that they were real and could come over and have coffee with you. Before I was even half way through with the book, I was already planning the next time I would read it, and that is very odd for me. I did not want it to end, and I am very sad that the author passed away and will not be writing 100 more just like this book. There are some very real, very sad topics addressed in this book, but it is so heartwarming, and so charming and filled with happy things as well that the sad topics just add to sucking you in and making you want to sleep with this book under your pillow. One of my friends said that the letter format made her feel as though she were missing out on something, but to me, it made me feel like I was more involved. You know how sometimes you can't find something to talk about with someone you live with everyday, but someone you see only once a week you can talk to for hours? That is kind of how I view the letter layout of this book. In short, I give this book 100 thumbs up and recommend it to everyone. This book is not a work of fiction, but it is one that will forever hold a spot on my bookshelf (my very full bookshelf that gets weeded frequently). The Pioneer Woman Cooks by Ree Drummond, author of the amazing blog, Pioneer Woman, is a wonderful, feel good cookbook. If you are counting calories, this is not the book for you, but if you like a few stories mixed in with amazing photos and truly delicious recipes, I hope you will give this a try. I have made several things from the book already and have found them all to be equally delicious. 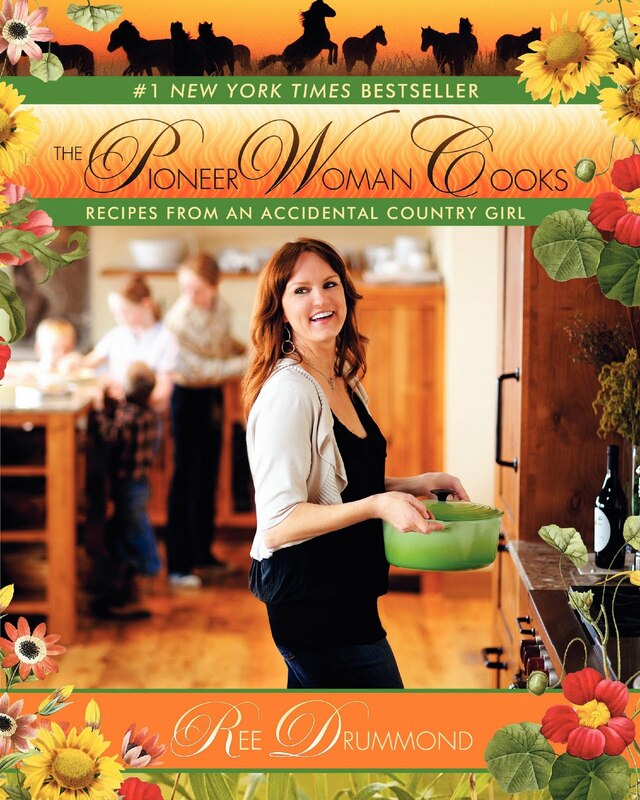 I have another of her books on my list of road trip reads - "From High Heels to Tractor Wheels". I'll let you know what I think once I finish. What is your favorite summer read? Anything you couldn't put down?